Alderman Wong Joins The Blogosphere! I just found out today that another of my colleagues on GP council has started blogging! Alderman Dan Wong has just started a blog of his own. Dan said his blog is going to be a mix of personal thoughts and council notes. From his first three posts you can tell that Dan will likely cover a lot of territory with his posts. So it's nice to be able to add fellow Grande Prairie council member Dan Wong and his blog to the Worthwhile Blogs section on the right side of the page. Scroll down and you'll find Dan's Blog in the Muniblogs section along with Leslie from Peace River and the guys from Crowsnest Pass; Gary Taje and Dean Ward. Check out Dan's blog to see another perspective of what it's like to be an Alderman in Grande Prairie. Welcome to the blogosphere Dan! 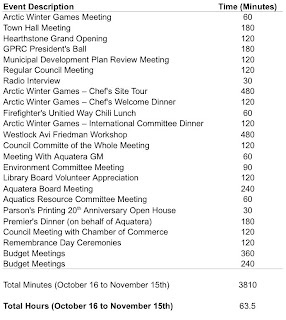 Here's where I spent my time in meetings and events from October 16th to November 15th of this year. 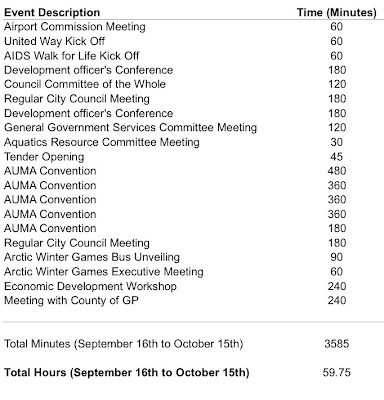 As I say every time; please take this only as a rough estimate of time spent on things that I have physically attended . Some of these may have taken slightly less or slightly more time. Also, I'm not including; time spent reading agendas, doing research, travelling to and from meetings or answering resident's phone calls & emails. Those add up too but again they are really tough to measure. For example I didn't include the 8 hours it took for me to drive to Westlock and back again. So, if you think I might be overstating how much time something took or that the amount of time spent isn't really all that onerous please keep these "unmeasureables" in mind - they add up. One of the questions that I get asked about city council pretty frequently is: "How much time does it take to serve on council?" It's a tough question to answer but I had started to make what I thought would be regular postings on the topic back this spring. Well, as things come and go I forgot to keep up with it until this great post from Leslie in Peace River reminded me that it's a question people might be interested in. As I said back when I first posted on the topic; it's difficult to say exactly how much time being on council takes. That's mainly because it depends on how much the individual council member chooses to put in to the job. You can attend information sessions or conferences to learn about new ideas that you can bring back to the council table or you can choose not to. You can attend at community events, either as the official council rep who brings greetings or just to talk to different groups of people to see what is happening with different sectors of the community .... or you can choose not to. As I also mentioned before you can't choose to ignore is reading. There is a lot of reading; background information and agendas are a part of practically every city meeting but this is still difficult to capture. For example "Did I spend a couple hours reading those agendas for the up coming week or was it only 15 minutes this time around?" One of the other things I find I'm doing more and more often is researching ideas and best practices from other places, again that time is tough to measure. Now, as I've said it's tough to measure everything so please; take this only as a rough estimate of things that I have physically attended at. Some things may have taken slightly less or slightly more time. Also, I'm not including; time spent reading agendas, doing research, travelling to and from meetings or answering resident's phone calls & emails. Those add up too but again they are really tough to measure. So, if you think I might be overstating how much time something took or that the amount of time spent isn't really all that onerous please keep these "unmeasureables" in mind - they add up. Before I head off to my Environment Committee meeting at 3pm I thought I'd take a moment to highlight a pilot project the city is running. I've mentioned LED street lights before when I saw them at the FCM convention in Quebec City. Well since then public works has installed two of the units on light poles in front of city hall. As you can see in the detail photo below the lamp head is a slightly different shape than regular lights. The biggest advantage of LED lights is that they take less power to operate so they can save money by reducing operational costs. In 2008 the city paid about $1.1 million dollars to keep the street lights on. Generally it's recognized that LEDs can reduce electrical use by up to 90% so, even if we were conservative and said we'd only see a 20% reduction in electricity consumption that would save tax payers over $200,000 per year! This is actually the city's second move towards LED lights on our streets - the first was when we converted the majority of our intersection traffic lights to LED technology. A note on the city's traffic FAQs page explains the savings that LEDs can achieve over the old incandescent bulbs, through their longer life-span and reduced power consumption. These LED lights are becoming popular especially in northern cities where winter means long, dark nights. Next time you drive by city hall at night check out the lights, they produce a little more of a "white" light compared to the "orange/red" light from the traditional bulbs. Hopefully you'll see them in your neighbourhood soon! I received this note from the Grande Prairie Volunteer Services Bureau. There are a couple of great educational opportunities for anyone involved with non-profit & community based organizations. Check out the VSB website for more great supports for community groups. And, for those looking for something to do, the VSB also maintains a database of volunteering opportunities. My attention grabbing headline aside; only one of the events is actually "free", the other is just very inexpensive. "- Alberta's Promise is hosting a professional development learning opportunity Community Building in Real Life. This is a sponsored fund development and capacity building workshop being held Thursday, December 5, 2008 from 8:45 am to 4:00 pm in the Muskoseepi Park Pavilion in Grande Prairie. There is no cost to attend but you must pre-register by Monday, December 1 here. This workshop will examine how a non-profit can use its social cause to change beliefs and behaviours as well as generate new resources. For further information, please contact info@albertaspromise.org or call 402-297-6665. Volunteers, board members and staff members are encouraged to attend. complimentary beverages, snacks and lunch provided. - Volunteer Alberta and Grande Prairie Volunteer Services Bureau are hosting an information session on Generative Governance, The New Perspective on Thursday, December 4, 2008 from 6:30 pm to 8:30 pm in the Muskoseepi Park Pavilion in Grande Prairie. This is an opportunity for organizations and their board members to gain some insight into a new and innovative way to govern. Whether your organization has an established succession plan in place or your organization is in the process of developing an effective governance model, we are all looking for individuals who will contribute responsibly to the governance of the organization. The cost to attend is $25.00 for one individual or $50.00 per organization ( 2 or more from the same group). To register, visit here. For more information, please call the VSB office at 780-538-2727"
"The library's fall fundraiser, Franklin's Family Christmas Concert, was a big success -- two sold out performances! Thanks to all the sponsors and to all the families that attended. A capacity crowd of Linda Smith's friends, family and colleagues were on hand at the library Saturday afternoon for the launch of her final novel The Broken Thread. Tears, laughter, music and moving tributes were shared as people celebrated and remembered Linda's life and talents. Elson the dog will be visiting the library on Thursday November 20 at 1:30 pm in the Story Room for a special story time about dogs, dragons and other magical creatures. Elson is featured in Elson and Elena's Adventures in the Autumn Forest. All ages welcome." There's a lot of change happening in our community. In fact change has become such a prominent feature of Grande Prairie that sometimes I enjoy just driving around to see what new building has popped up or what new business has opened! I've often thought that it was a shame no one was documenting these changes. One of the fun things about being on council is that we know where things are about to happen. On the private sector side we approve plans for neighbourhood designs and commercial developments. In the public sector we see the project proposals, often help find land for them and sometimes even fund them directly. I decided to put a little of this knowledge to use in the summer of '07 by taking "before pictures" of sites that I knew would see some massive changes shortly. I should point out that I was really inspired to do this by the work of Beth Sheehan. Mrs. Sheehan documented much of the community in the early eighties by taking pictures of businesses and street corners all across the city. Beth's photos are at the South Peace Regional Archives. This site is directly south of City Hall, just behind the Care Centre and Aberdeen Place. Today construction is in full swing on the land city assembled as a site for Rotary House - the replacement for the aging Wapiti Dorm homeless shelter. To the West of City Hall earth-work is just underway on the site of the former Montrose Junior High School. The new Montrose Cultural Centre is nearing completion and will be ready for it's grand opening in 2009 when this replacement for the Library and expansion of the Art Gallery will host the Lieutenant Governor of Alberta Arts Awards. Well, council has worked through the first two days of budget meetings for the year. Wednesday and Thursday focused on reviewing the 2009 budget and the capital portion of the 2011 budget respectively. To carry on a tradition I started last year I'm posting the unedited list of motions produced changes to the budget. This list is just from the first couple of days so there will likely be more next week when we deal with the operating potion of the 2011 budget. 1.Moved by Alderman Wong that the City fund $10,000 per year for 2009, 2010, 2011 for Community Futures for a grant writer. 2.Moved by Alderman Given the 2009 budget be adjusted to add $3-million and a further $3-million total in 2010/2011 for the Community Energy System, with the source of funding beingborrowing. 3.Moved by Alderman Rice that the budget be adjusted to reflect $250,000 in 2009 and $250,000 in 2010 to be allocated to the Community Village Capital project. 4.Moved by Alderman Given the 2009 budget be adjusted to fund the SPCA at a 1:1 ratio with the County of Grande Prairie up to a total of $25,000. 5.Moved by Alderman Given the 2009 budget be adjusted to reflect a total of $85,000 for a Marketing Coordinator position for the Aquatics and Wellness Centre commencing January 1, 2009. 6.Moved by Alderman Given that Council adjust the 2009 budget to reflect $50,000 funding for STARS. 7.Moved by Alderman Rice the 2009 budget be adjusted to add $28,000 for transit shelters and stops. 8.Moved by Alderman Rice the 2009 budget be adjusted to add $45,000 for one mechanic commencing in July. 9.Moved by Alderman Rice the 2009 budget be adjusted to delete $40,000 for a Communications Coordinator. 10.Moved by Alderman Blackmore the Grande Prairie Museum Expansion project be delayed to reflect project planning costs in the 2011 Capital Budget and construction costs in the 2012 and 2013 Capital Budget. 11.Moved by Alderman Wong Council allocate $500,000 in the 2011, 2012 and 2013 Capital Budget for the River of Death and Discovery Dinosaur Centre project. Hiring a Marketing Co-ordinator for the new multiplex. - This position is in starting in January 2009. - This position is not in, the city is receiving funding for a Sustainability Coordinator from AUMA and the majority of council thought that would be good enough for the time being, maybe in 2010. The future of the Dave Barr twinning. - I flagged this item and we'll be talking about it today. - Is in! Really this is the big news of the day, a total of $6m between now and 2011 to create Alberta's first bio-fueled district heating system. After a lot of debate, my motion to include it passed with a narrow 5-4 margin. I've gotta go now but remember the sessions are open to the public - if you want to check it out first hand you are welcome to join us! We'll be at the Holiday Inn again today from 9 am to 12 pm and we'll be there again on the 19, 20 & 21. 5 Days of Budget - Starts Now! This morning council will kick off 5 days of budget discussions. We run a three year budget cycle normally but this time around we are also setting the 2011 budget. The extra year will readjust the 3 year cycle to avoid what we had this year where a new council's first responsibility after getting elected is to deal with three years of budget. I'll post more on the budget over the next couple of days but the sessions are open to the public - if you want to check it out first hand you are welcome to join us! We'll be at the Holiday Inn from 9 am to 4 pm on Nov 12, 13, 19, 20, 21. Come and see how a budget is made, I'll save you a seat! A few weeks ago I wrote about the success of council's first 'town hall' meeting. You might remember that the first question posed to council that night was about graffiti... specifically if it was possible to create a program to engage, let's call them "street artists" to produce public murals rather than having them defacing private property. Well, at this morning's Protective Services Committee meeting there was some follow up on the graffiti issue. Alderman Alex Gustafson has asked to have an item added to the agenda to discuss the issue. Although Alex wasn't there to speak to it we did get some helpful information from administration and asked them to develop a program for our consideration. Record It - Take a picture of the graffiti as soon as it's identified. Report It - Report all incidents of damage to your property by calling the local RCMP detachment at 780-830-5700. Remove It - Remove graffiti from your property as quickly as possible. The faster and more frequently graffiti is cleaned up, the less it appears. If you remove graffiti within 24 Hours - there is a 10% chance it will reappear. But if you wait 2 weeks to remove it there is a 100% chance it will reappear. The best solution is to remove it immediately whenever it appears. Eventually the vandals will give up. As a part of the effort to clean up the community Crime Prevention (in partnership with the Chamber of Commerce and the DownTown Association) have clean up kits available. The kits provide everything a property owner needs to wipe out the graffiti (aside from the paint - you'll have to match your own). They also have a great Idea Book (downloadable PFD here) that includes facts about graffiti, suggestions on how to set up your own graffiti wipe out day, and contact info on where to get the clean up kits. Find out more about the program on the Crime Prevention "Graffiti Wipe-Out" page. So, the efforts to wipe out graffiti are obviously well underway but that still left the question of how to direct these "creative urges" in a more positive manor. I suggested that what is really needed is a program where the city (in partnership with building owners) specifically sanctions graffiti on certain walls. Hopefully we'd be able to give the "street artists" a place to express themselves while working within some content ground rules. I can't see any harm in at least trying to provide a positive option for those who are currently working on the wrong side of the law. The committee agreed and asked admin to develop a concept for such a program and report back at a future meeting. 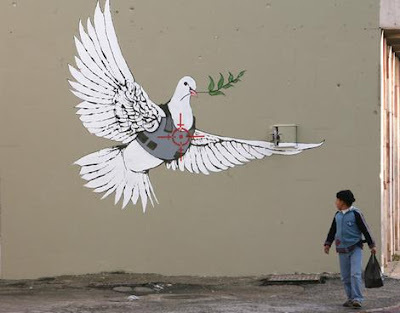 Maybe one day we'll be able to help graffiti move past it's current status as vandalism to more of a kind of "urban art". Providing space for it is just one challenge, the next is finding those truly creative artists who have something to say and the skills to say it well.